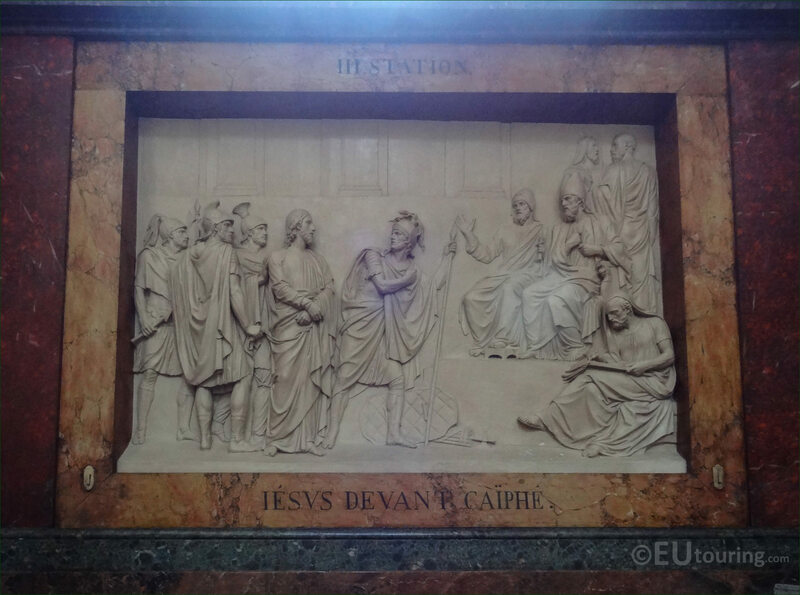 We were again in the 1st Arrondissement of Paris at the Eglise Saint-Roch, when we took these high definition photos showing a bas relief called Jesus devant Caiphe, which was sculpted by Louis Pierre Deseine. 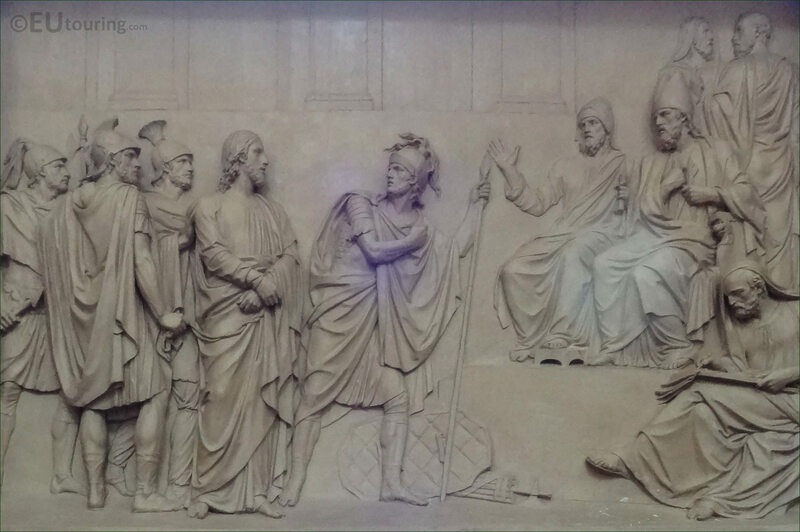 One of several, this first HD photo shows a bas relief depicting a biblical scene called Jesus devant Caiphe, which in English translates to Jesus in front of Caiaphas, and he was the Jewish High Priest who is said to have organised the plot to kill Jesus, although this is sometimes referred to as Jesus in front of Pilate. Now this is one of six bas reliefs called the Stations of the Cross, sometimes referred to as the Stations of Christ, which were all produced in plaster with this particular one was sculpted in 1805, that were specifically to adorn different chapels within the Eglise Saint-Roch, and this low relief is located within the Chapelle de Saint Joseph, which is on the left hand side of the church as you have entered from the Rue Saint-Honore. Here you can see the title of the plaster relief, Jesus devant Caiphe, which was produced by Louis Pierre Deseine who was born in 1749 and studying to become a French sculptor he won the Prix de Rome in 1780, that led to numerous commissions for statues and sculptures, yet he became most well recognised for his busts, many of which can now be found at the Chateau de Chantilly and the Chateau de Versailles. 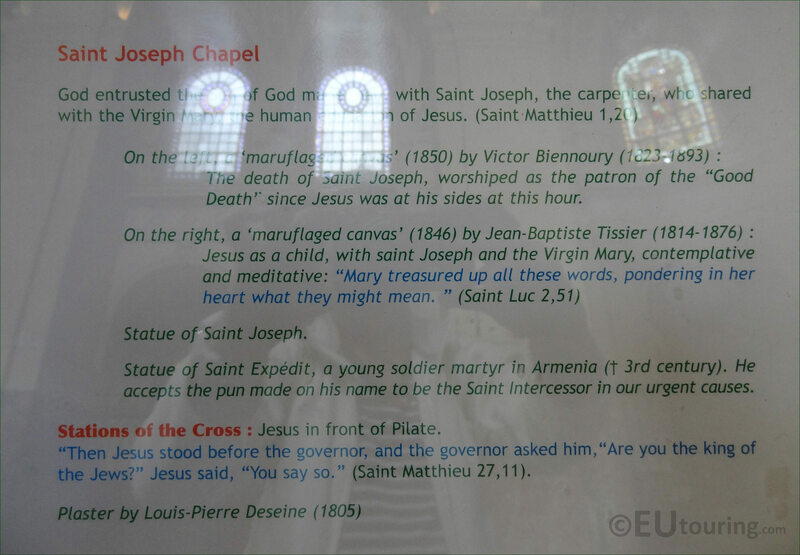 However, this photograph shows the tourist information board detailing different aspects and art works found at the Saint Joseph Chapel within the Eglise Saint-Roch, and as you can see here, it mentions Jesus in front of Pilate, who is most well known for the trial and crucifixion of Jesus, with a quote underneath from the New Testament, rather than Jesus in front of Caiaphas, who initiated the plot to kill Jesus.